A French copper saucepan and cover, dating from c.1880. 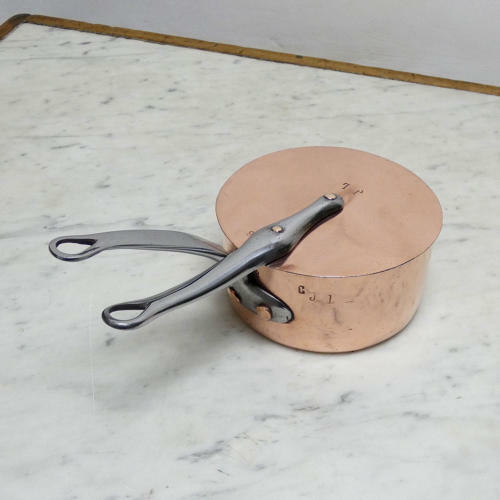 This saucepan is made from a heavy gauge of copper and the lid is a slightly thinner gauge. This was quite normal with this style of lid. The steel handles are the typical French shape. The pan is marked, to the side, with a letter 'B' in one place and 'C J L' in another. The lid has the 'B' and just the 'J L' together. These letters would probably relate to previous owners. It is in excellent condition and the interior has been re-tinned so that it can be used. The pan itself measures 15.6cm. diameter by 8cm. deep. The other sizes given are the overall dimensions.